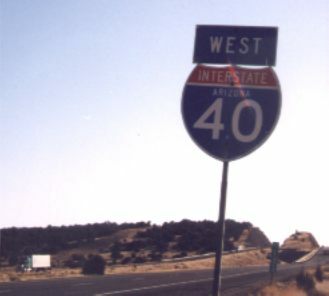 I-40 replaced US 66 for its entire run through Arizona. 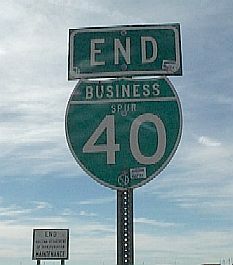 I-40 has business loops in Kingman, Ash Fork, Flagstaff, Winslow, Joseph City, and Holbrook (all old US 66). Winslow also has a rare Business Spur, which hangs off the west end of the Business Loop (both part of old US 66). It's only signed at the end away from the interstate. I suspect it was created to keep the old US 66 railroad bridge on the state's books, rather than Winslow's. 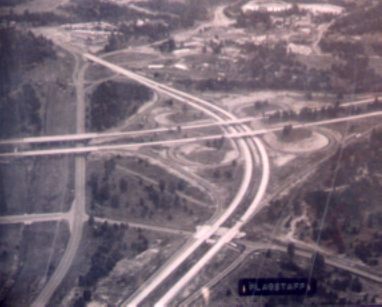 The aging cloverleaf interchange of I-40 and I-17 is finally being upgraded. The new E to S ramp is shown above. The design of the E to N ramp is a little unusual. After splitting from the E to S ramp, it goes under the SB side of I-17 and merges into the left side of the NB lanes. ADOT is in the process of removing all cloverleaf interchanges in the state. I-40's Colorado River bridge. 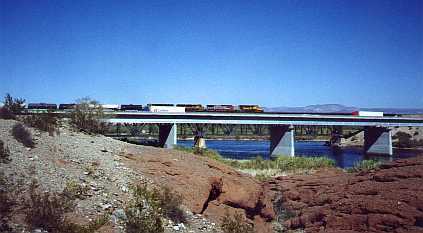 The Santa Fe rail bridge is behind it.